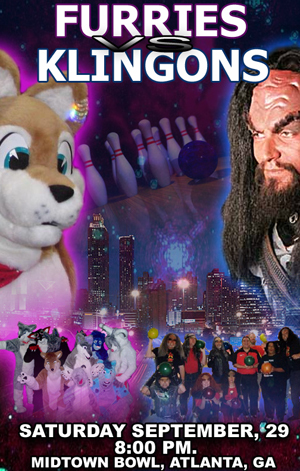 It was the battle of the fandoms on September 29th, 2007 when Atlanta furries took on a challenge by local Trekkies in Furries vs. Klingons, a bowling competition held in Atlanta, Georgia between a group of furries and two local Star Trek fan clubs. The event was organized by the USS Republic NCC-1371 (the Atlanta chapter of STARFLEET International) and the Atlanta MurrFurs. The Atlanta chapter of the Klingon Assault Group, a.k.a. KAG Atlanta, was also invited to compete. "Lucky Wolf," a member of the MurrFurs, created the poster image that billed the event, somewhat misleadingly, as "Furries vs. Klingons," despite the fact that it was actually a STARFLEET event.. The Klingon team - most of whom appeared to be humans in regular Star Trek uniforms - emerged victorious, with a score of 32 to 27. However, the furry team had far more members than the Klingons. The event was first announced on the Atlanta Furs community LiveJournal, and the news spread from there. It hit not only furry websites, but also popular websites Boing Boing and Fark, and was attended by G4. An online poll of supporters attracted over 500 votes, which were evenly distributed between the teams. The furries were at a disadvantage as fursuits made bowling difficult; specifically, the paw gloves made holding the ball tricky and the costume head obstructed vision. However, not all furries - or Klingons - were in costume. Due to uneven numbers, the winners were decided in a bowl-off between the top five bowlers from each side. There is a trophy BTW, but it doesn't matter who wins or who loses, we are all just here for fun.